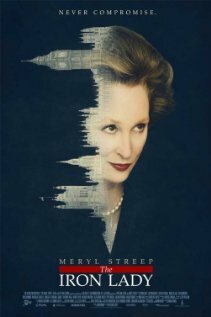 The movie, The Iron Lady, about Margaret Thatcher, prime minister of Britain from 1979 to 1990, starring Meryl Streep, is worth watching for a number of reasons. One is the opportunity to refresh our minds about a major figure of recent history and her influence upon those times. Another is to watch Streep’s performance in the role. She loses herself behind a helmet of hair, false teeth, and piles of make-up to become — brilliantly — Mrs. Thatcher. Yet another reason — and for me the most compelling one, though it is quite controversial — is the decision to tell the story from the perspective of Mrs. Thatcher’s current dementia. The movie opens with a frail, old woman tottering away from a grocery store. In the next scenes, we see Mrs. Thatcher breakfasting with her husband Denis, then telling him what he’ll wear for the day. Soon we realize that Denis Thatcher, in fact, is dead, and that his frequent “presence” is a function of his wife’s current confusion. Some of her memories are still quite vivid, however, and so we see her life through a series of flashbacks: her rise to power, her challenges and successes, her opinions. The Falklands War and subsequent economic upturn grant her an interval of acclaim, but for the most part, she is an unpopular prime minister. She retains the leadership for about 11 years, then is ousted by her own party. The Margaret Thatcher we see in these flashbacks is unbending, driven, and difficult to like, though admirable for the strength of her convictions, her tenacity, and the barriers she broke. She seems to be constantly directing, lecturing, or hectoring those around her, who are usually men. But all this through the lens of dementia – what effect does that have on the life of the woman, on how we perceive her story? Does her condition in old age become what this movie is about, and if so, what story is it telling us? Is it a story of comeuppance – ah, how the mighty are fallen! – that she who was so powerful, so seemingly uncaring at times, is now reduced? Or, is it a story of profound humanity that arouses our compassion? At the same time, the elderly Mrs. Thatcher in the movie returns repeatedly to memories of her husband Denis, and their interactions, also of happy family times at the beach. She asks the Denis Thatcher she imagines being present, “Were you happy, Denis? Tell me the truth.” Is there, in the weight of these memories, a sort of reflection, after all, that either re-orders priorities, or perhaps reveals them more clearly than the public persona did? I too have direct experience of the reality of dementia. Unlike Mr. Pemberton, I don’t think respect of Mrs. Thatcher requires us to turn away from the face of her dementia, while freely viewing her face as she gives orders about miners on strike or the Falklands War. Since the movie, I’m mulling the life of this woman, wondering about the parts and how they add up, what they mean. I find resonance here with experiences of dementia in my family. I came away from the story feeling newly attentive, newly full of questions, both discouraged and encouraged by what remains in the lives of dementia sufferers and how that illumines, contradicts, undoes, or re-forms the rest of their history. Have you seen The Iron Lady? What did you think of it? This entry was posted in Movies and tagged controversy over Iron Lady portrayal, dementia, Margaret Thatcher, Max Pembertony, Meryl Streep, The Iron Lady by doradueck. Bookmark the permalink. Thanks for posting, Dora. Thatcher always intrigued and bothered me. And now, controversial as it might be, the overlay of dementia’s reality in this portrayal will, I hope, help us grapple with that huge health issue, since it touches so many of us in our families. I’m eager to see this movie. I haven’t seen the film yet, but you put it on my list. I love Meryl Streep in almost anything. Also, love the look of your site. Very clean and light! The movie itself has received a lot of negative reviews in the press, although Streep’s performance has been lauded by all these same critics, and she did get a Golden Globes award for that performance. Your reflections on the movie REALLY want me to go see for myself, although, not matter what the movie, if Streep is in it I’ll go see it! Streep’s performance is so true and so uncannily accurate, so full and so complete in its understanding, that she is fascinating every second she is onscreen. As for the film itself, the structure is a bit off and the screenplay doesn’t really give us much else other than a history lesson, but a good history lesson at that. Nice review. Check out mine when you get the chance. Thanks for this review. Like others who’ve replied, I want to see the film now that I’ve read your response to the film. Recently I read the novel Still Alice, by Lisa Genova, a writer with a Ph.D. in neuroscience. The novel portrays dementia/Alzheimer’s as it comes too early in life to a woman who has everything–a Harvard professorship, a good marriage, three talented children. Although it was grim I couldn’t stop reading; I found its connection to the character’s humanity, flaws and all, to be refreshing, as well as its head-on exploration of this terrible disease. Having had direct experience with dementia, I resonate with your conclusion: “I came away from the story feeling newly attentive, newly full of questions, both discouraged and encouraged by what remains in the lives of dementia sufferers and how that illumines, contradicts, undoes, or re-forms the rest of their history.” I will look forward to this film not only for Streep and a glimpse into Thatcher’s controversial legacy, but for a portrait of a disease. I wonder whether the dementia would make her more sympathetic to an audience, or whether a contemporary audience needs that perspective to soften a portrait of a very powerful woman. Thanks, all, for your comments. It’s always tricky to “recommend” anything, but if any of you are so inclined, would enjoy hearing if it was thumbs up or thumbs down for you. It seems to be one of those movies that it’s hard to be neutral about. @annhos — intrigued by your last comment whether contemporary audiences need “that perspective to soften a portrait of a very powerful woman.” Good question. Ah, yes, we continue to be fascinated by “our” royalty. 🙂 To my recollection, the Queen does not appear in the movie. The rumor is that Mrs Thatcher was not one of the Queen’s favorite prime ministers. Agatha & I went to see this movie, inspired in part, by your blog. Totally enjoyed it. The dementia lens was powerful but also painful. When Erika and I were just married we didn’t have a TV so often at suppertime we would listen to Barbara Frum on “As it Happens.” A few years ago I was browsing in the cbc.ca archives and I found two interviews she did with Mrs. Thatcher. In the first one she was unprepared and Thatcher arrogantly told her off for not having her facts straight. In the 2nd interview Barbara is prepared, and she goes head to head with her and leaves Mrs. Thatcher virtually speechless at the end. A fascinating video. I can only imagine, as you say, that these encounters were iron meeting iron. Often listened to Barbara Frum myself. Must look up those links and give a listen; thanks very much!